‘MARINA MONSTER’ is a sequel to ‘SHARP TEETH’, about a mutant monster carp ravaging a nature reserve before escaping into a marina. Based on true facts, adaptable bull sharks are invading fresh water. Even with their poor eyesight, bull sharks are vicious predators. Arriving in a freighter’s bilge, a baby bull sharp eliminates all the fish in the Bay before attacking victims in marinas and docks. The former chemistry major, Earl Molar now works in the fisheries department of the Centre for Inland Waters noting the sudden depletion of the local fish. When Earl meets Oceanna at the Blue Angel Gallery, smitten, he doesn’t realize the bitter Capulet-Montague rivalry between two local yacht clubs for the coveted Bay Cup. Earl’s father Drip Molar is commodore of the Regal Yacht Club while Oceanna’s father Rusty Anchor is commodore of the Bay Yacht Club. Now rag-newspaper reporter Lola Dent relentlessly pursues Earl as well as his father’s mistress, Zena and third wife, Sandee. A scheming banker, Drip has recklessly squandered the yacht club’s money and an audit is pending. Drip must win the ‘Around-the-Bay Sailing Race’ to replace the funds. His second wife, former Dean Kitty Devine tries to blackmail her way back into his arms. Earl and Oceanna shocked to see a bull shark recklessly attacking in the marinas, can’t convince their fathers to listen while dodging merciless reporter Lola Dent. Out on the bay on the day of the race, Earl rescues capsized Oceanna while her father Rusty wins the ‘Around-the-Bay Sailing Race’. Blending suspense, humour and romance, you’ll remember the camp hysteria and returning loony characters in ‘Marina Monster’. Marina Monster….don’t go near the water! ‘MARINA MONSTER’ premiered at Mohawk College, Hamilton ON on October 27, 2006. 25 film days – 120 cast and crew. 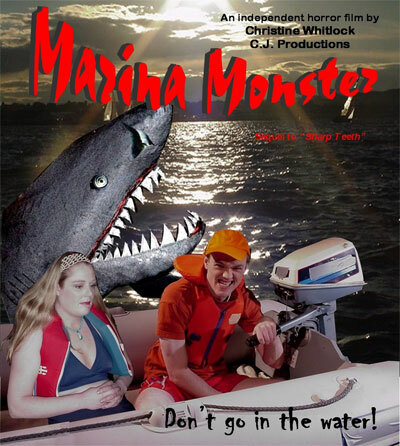 Also on Amazon http://www.amazon.com/MARINA-MONSTER-killer-independent-feature/dp/0969543298/ref=sr_1_4?ie=UTF8&qid=1384001059&sr=8-4&keywords=christine+whitlock. and www.ebay.com.